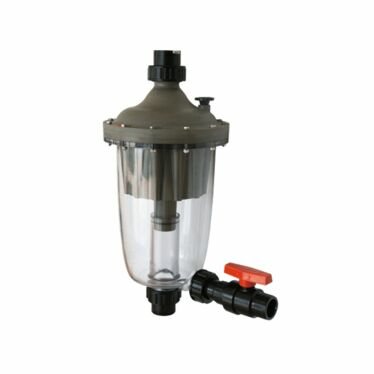 The MultiCyclone works on the basis of centrifugal water filtration. There are no moving parts to wear and tear and no filter media to clean or replace. Incoming water is guided by a diverter plate so that it enters multiple hydrocyclones tangentially, generating a strong centrifugal effect. This spins the sediment out to the hydrocyclone’s wall and then spirals it down to the sediment sump, while the cleansed water spirals upwards. 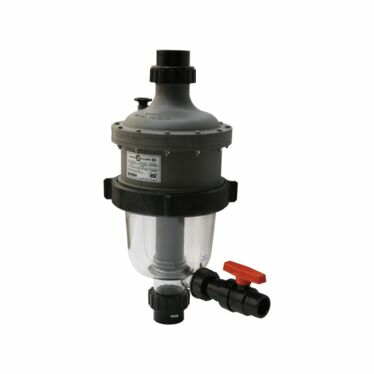 and developed the MultiCyclone MC12: a vertically-mounted, all-in-one prefiltration system. An ultra-compact design, the MC12 includes all the features and benefits of centrifugal filtration as incorporated in the MC16 model. The difference is that the MC12 contains fewer cyclones, resulting in the unit being able to operate at lower flow rates while still being able to remove sediment from the pond water. On top of that, an air release valve has now been incorporated into both the MC12 and MC16 MultiCyclones – this not only helps to expel any unwanted air within the system, but also helps in cleaning out the sediment chamber. With a clear sediment sump so you can actually see the waste being removed from your pond system, this is the perfect piece of equipment to ensure that you get a crystal-clear view of your Koi this season.